When Katara pulled into the International Yacht Club Antibes last summer, her height prompted one onlooker to comment, “It is like an extra wall at the end of the jetty.” Those involved in her construction and ownership have been quite tight-lipped, so few details are available, other than that she’s visited the USA, the Caribbean, and Europe over the past year. Katara flies the flag of Qatar and could be owned by the emir of Qatar, Hamad bin Khalifa Al-Thani, though it’s not confirmed. If you’re going to throw a party to end all parties, Alexander might fit the bill. 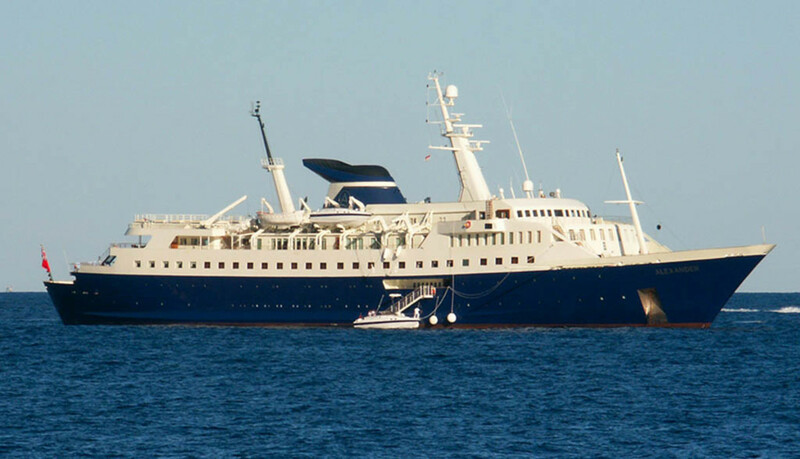 First, she can accommodate 80 guests in 27 staterooms. 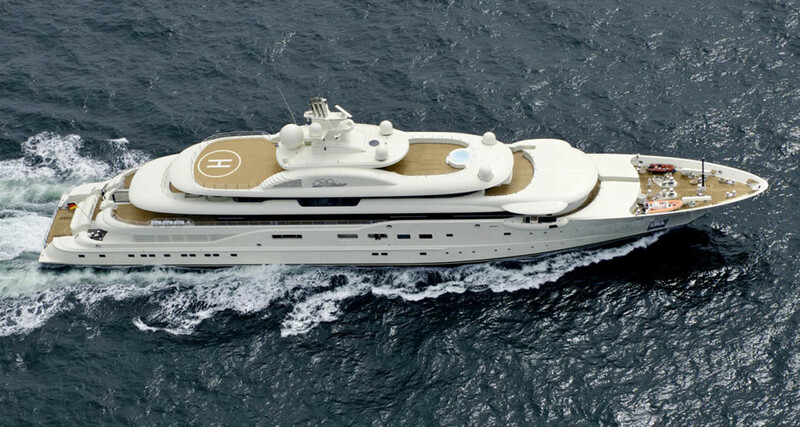 Second, she has a pool deck, overlooking the main aft deck. Then there’s the “Starlight Disco,” an aptly named room if we’ve ever heard of one. Wherever you choose to entertain onboard, you can do so knowing that various heads of state and other VIPs have done the same over the years. Her rate: €630,000, or about $830,530, per week. A wins the award for Most Difficult Yacht to Google. (Go ahead, try it.) Her owner, Russian banking and steel magnate Andrey Melnichenko, christened her in honor of his wife, Aleksandra, as well as himself. Lest they risk missing a view from their master suite, perched high within the helmet-like superstructure, the bed rotates at the touch of a button, on a platform that also turns independently. Overall, A boasts 23,600 square feet of relaxation space, almost all of which is indoors. 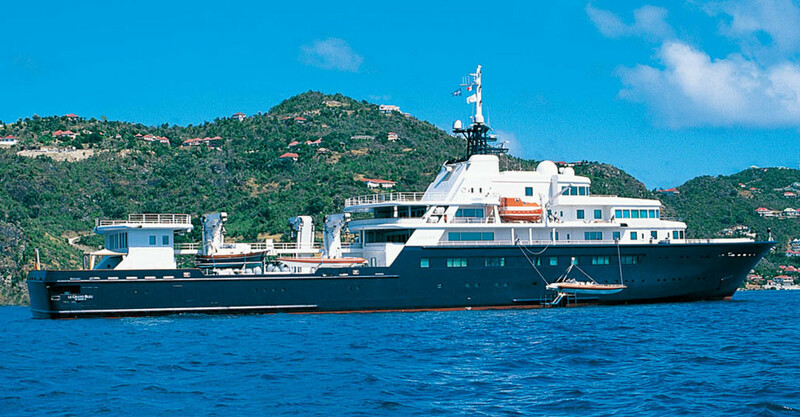 Seventy guests can stay aboard Turama, which is available for private and corporate charters. If you enjoy a good game of poker, or even just a rousing round of Go Fish, check out the dedicated card room. When you win fair and square, treat yourself to some relaxation time in the sauna, located a few paces away. Or, tickle the ivories on the main saloon’s grand piano. Should your card game go long into the night, get a cup of freshly made java at the Espresso Cafe on the “reception deck,” one level down from the main deck. 15. Atlantis II • 379&apos;7"
The heirs of Stavros Niarchos, the famous Greek shipping baron who had a long rivalry with Aristotle Onassis, have used this yacht since his death in 1996. She rarely cruises, though, remaining much of the time in Monaco. Niarchos commissioned her as a replacement for Atlantis, which he gave to King Fahd of Saudi Arabia (later named Issham Al Baher). This is the second of a few yachts belonging to Roman Abramovich (see no. 1). She’s an expedition-style yacht, the largest such in the world. There’s a pool on her aft deck, and her swim platform is more like a beach club unto itself, given its beam and depth. Other than the fore-and-aft helipads, few other details are known, though Donald Starkey Designs is responsible for her interior. 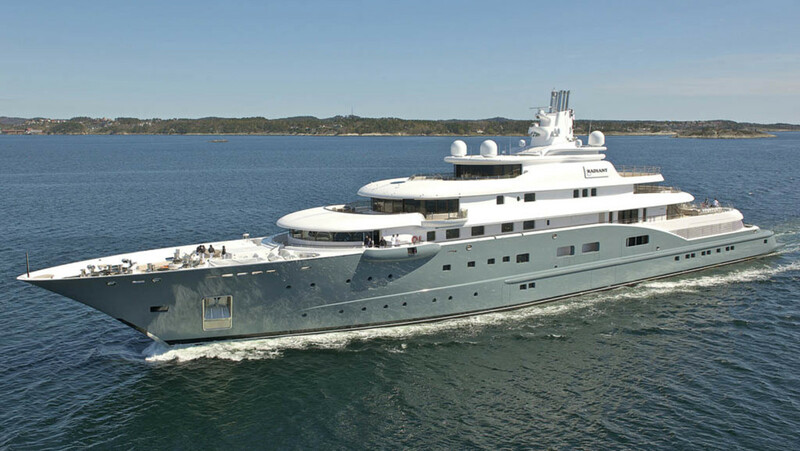 To put the past decade into perspective, Pelorus was Lürssen’s largest megayacht when she was launched. Now four other Lürssens outrank her on our list. Despite that, Pelorus still turns heads and is more than worthy of the attention. Myriad platforms fold down over the water, forming balconies and a beach club—features incorporated well before either became de rigueur. Pelorus belonged to Roman Abramovich (see nos. 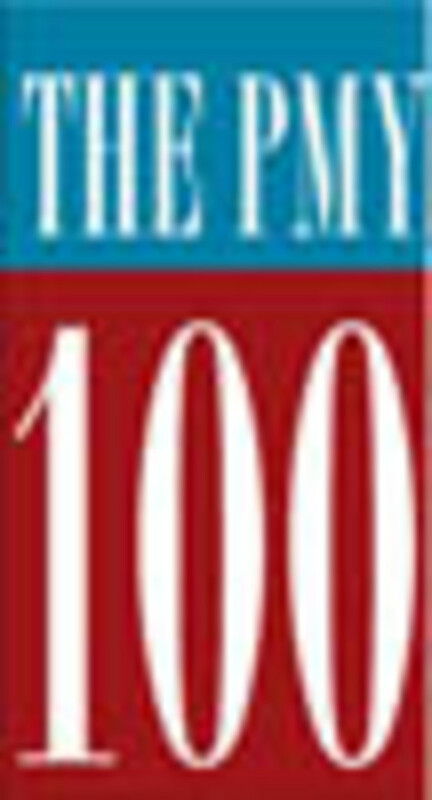 1 and 16) for many years, but she’s now in the hands of American media mogul David Geffen (see no. 6). 18. Le Grand Bleu • 370&apos;0"
Eugene Shvidler, a Russian-born asset-management and oil billionare who’s now an American citizen, acquired Le Grand Bleu about six years ago. Word has it the yacht was a gift, from a good friend and business partner. Who might that be? Roman Abramovich (of course)...but even he’s not the original owner. And the identity of the original owner isn’t as interesting as the story of how Le Grand Bleu came to be. A young naval architect named Stefano Pastrovich, who in the late 1990s was employed by famed designer Martin Francis, was tapped by Claus Kusch, a longtime project manager, to design a yacht to be built in Germany. The owner wanted something similar to Senses, an expedition yacht that Pastrovich had a hand in designing, but longer. “I did a preliminary general arrangement by hand with pencil and ruler,” Pastrovich states. Five days later, the profile and arrangement were finished, and Kusch presented the design to the client. 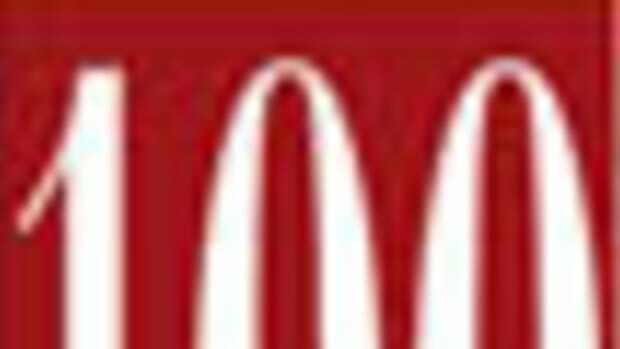 (The client, by the way, was John McCaw, an American telecommunications mogul.) He greenlighted the design as-is—astounding all, but none more so than Pastrovich. Dilbar is said to be named in honor of the mother of Alisher Usmanov, a Russian oligarch with varied business interests, like iron ore, media, telecommuncations, and sports (British soccer team Arsenal). 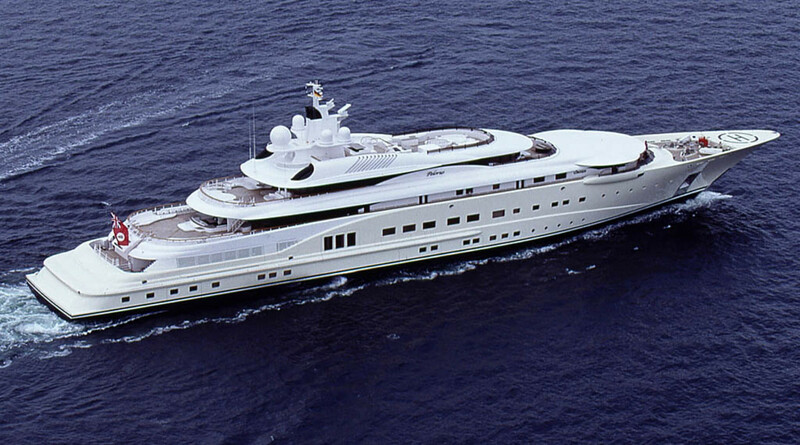 Several reports state that Usmanov named the yacht after his mother, just as he did a smaller yacht a few years prior. The yacht, a frequent sight in Antibes, has a beam of 52 feet. Bearing a gray hull, Radiant has an envious crew-to-guest ratio, accommodating 16 guests and 44 crew. Various hatches open to reveal tenders and their related launching systems, or fold down to form balconies. There’s additionally a hatch about amidships on the main deck that, when open, connects to stairs leading down to a tender. Guests get use of a private cinema and spa, among other niceties, with interior design by Terence Disdale and Yabu Pushelberg, the latter known for hospitality and retail-space design as well as luxury residential design.